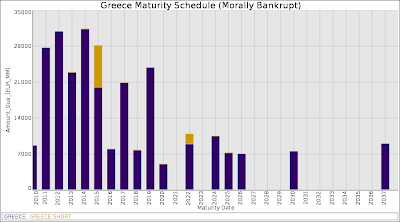 So, I'd like to publicly admit here that I was oh-so-wrong about Greece. It looks like they really won't be able to make it through May without a bailout. I really didn't expect this to happen until 2011 or 2012 but, with 10yr rates at over 800bp, fresh downgrades and rumors of restructuring, it doesn't look so good. While many are going to go on about the moral hazard in the bailout and why they should be kicked out of the Euro, I want to focus on something else. Why would other Euro countries agree to a bailout? "When you owe someone $1,000 and you can't pay, you have a problem. When you owe someone $100,000,000 and you can't pay, they have a problem." 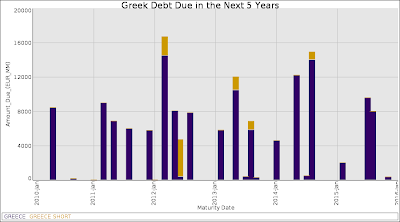 Banks across Europe hold Greek bonds. The fact that they could be repoed at the ECB for liquidity and they had a higher yield made them attractive. If Greek creditors push Greece too hard, they might just take their proverbial ball and go home. They really could just give up on the Euro and tell their creditors: I'm not paying you. If that happens, a lot of European banks are likely to face substantial losses. I can't tell you how much because there is no reliable source for this data, even what you see in Die Spiegel seems a little iffy. If what we saw during the Panic of '08 is any indication, banks taking the Greek losses would simply end up bailed out by their respective governments anyways. The liabilities won't vanish, they'll just move to a larger balance sheet until they reach the biggest one (governments), at which point they are socialized. It's just the way it works at this present point in time, so deal with it. Back to defaults: A ruthless external default would do no good for anyone. A disorderly financial meltdown would risk contagion across the rest of the heavily indebted EU nations and emerging markets. Rising spreads could put enough pressure on the likes of Spain, Italy or Portugal that they too decide they can't/don't want to play the EUR game anymore, which brings us back to the whole bank liabilities thing. Someone, somewhere owns all this debt and someone, somewhere is going to have to take a loss if we let this all get out of hand and, if that loss is big enough, then we'll all have to share this loss through inflation, recession, higher taxes, service cuts etc. There is no way around it, the debt must be paid in some form or another by someone. Stoking a disorderly collapse will just ensure we'll be the only ones cleaning up the ensuing mess. I love recession pr0n just as much as the next blogger (we are a bearish bunch) but these are real lives we are talking about. I am in no means fan of a bailout, but it might be the least-costly way to resolve this. Italy, Ireland, Spain and the UK are all on shaky ground as far as debts go, they don't need their spreads shooting up. A disorderly collapse that leads to bank bailouts, another recessionary dip and more fiscal stimulus sounds really expensive, politically, socially and financially. 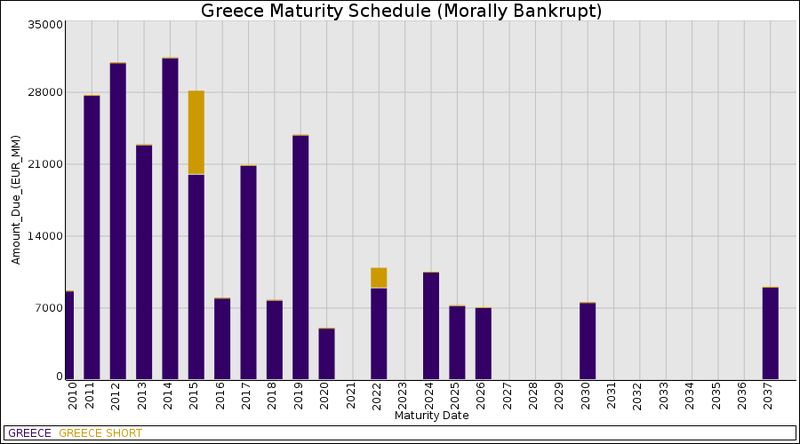 Greece might be able to get out of this predicament, or not, but we won't know unless they get a chance. Yes, the proposed rescue package is essentially just kicking the can down the road, but time has a funny way of healing some wounds. I can't believe you are defending that profligate bunch! Why couldn't be more like industrious Germany with that awesome trade surplus?! Whatever, seriously. You can't run a surplus without someone running a deficit, it's just the way it works. Savers need borrowers and vice-versa. Not only that, but Greece paid a risk-premium. A risk-premium is extra yield you pay because there is--wait for it--risk! A risk-premium is what you pay for the right to fail. By asking for a risk premium the market is saying, "We'll lend you this money, but at higher rates because we are not sure you'll be able to pay us back." Creditors can demand their money all they want, but you can't take back something that isn't there anymore. They aren't going to get it, so they might as well try to be civil and try to figure out a plan to recoup whatever they can because at this point the debtor holds a lot of cards.